Osteoarthritis (commonly referred to as wear and tear damage) to the knee is the most common form of arthritis causing knee pain, particularly in middle aged and older patients. For most patients this is a gradually progressing degenerative condition and patients have a varying level of genetically determined pre-disposition. The condition is one in which the perfectly smooth articular cartilage covering the ends of the femur, tibia and patella, that allows almost frictionless movement degenerates first softening then breaking up and eventually wearing away completely exposing the underlying bone. This is referred to as end-stage or severe osteoarthritis. This is a harmless condition but as this progresses increasing knee pain and stiffness that is worse with activity develops. Other types of arthritis can also affect the knee including rheumatoid arthritis (an inflammatory disease) and other inflammatory types of arthritis. These inflammatory diseases can also damage the cartilage covering the ends of the femur, tibia and patella. Post-traumatic arthritis can develop after a serious knee injury, particularly after fractures disrupt the smooth joint surface and covering of articular cartilage. Unfortunately badly damaged cartilage does not heal and when large areas of articular cartilage are damaged and the underlying bone is exposed, non-surgical treatments do not relieve symptoms sufficiently. The main feature of osteoarthritis is activity related pain that has worsened over time. In the early stages aching might be experienced during and after prolonged physical activities. As the condition progresses, the pain usually worsens and increasingly interferes with activities. Severe arthritis can severely limit the distance a patient can walk and can disturb sleep. Other symptoms include swelling, grinding, locking and sometimes giving way but pain tends to be the predominant symptom. 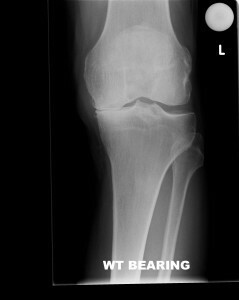 If arthritis predominantly affects the inside (medial compartment) or outside (lateral compartment) of the knee then patients can develop an increasing bow-legged or knock-knee’d deformity. The diagnosis is usually made from a history of increasing pain along with findings on examination. The diagnosis can usually be confirmed with X-rays that demonstrate reduced or complete loss of space between the bones, indicating that the joint surface cartilage has been worn away. When arthritis is less severe or is only in certain parts of the knee X-rays might be normal and an MRI scan or even arthroscopy might be required to confirm the diagnosis and assess the severity of the condition. Early in the disease process when damage to the joint surface cartilage is not severe, arthritis will often respond well to non-surgical measures. All patients should take simple measures to minimise the symptoms they experience from knee arthritis. Symptoms can be reduced by reducing impact or jarring activities, by improving the shock absorption of shoes and the surfaces walked or played on, by weight reduction if overweight. Using of a walking stick will also reduce stresses and subsequent pain. Physical treatments are aimed mainly at increasing the capacity of the knee to cope with exercise and maintaining a range of movement. The main aim of the physiotherapy programme is to improve the quality of muscles around the knee so that they can act as external shock absorbers to compensate for worn out internal shock absorbers. Medical treatments includes the use of simple painkillers (analgesics) such as paracetamol, anti-inflammatory medication and other analgesics. If different sorts of analgesics are used then the pain-killing effects can add up to provide greater pain control. For example paracetamol and ibuprofen (an anti-infalmmatory analgesic) will usually provide better pain relief than either analgesic taken by itself. Taking analgesics before and/or after performing activities that exacerbate symptoms, e.g. walking or playing tennis, can often allow patients to perform these activities more easily. Injections of cortisone can be useful particularly for exacerbations of arthritis. Injections of lubricants such as hyaluronic acid (e.g. synvisc or duralane) can also provide benefit although this tends to be temporary. An arthroscopy operation (keyhole surgery to debride unstable cartilage and wash out debris) can sometimes be of benefit for acute flare-ups/exacerbations of pain from knee osteoarthritis. Arthroscopy can also help relieve mechanical symptoms of catching, lockings and grinding. It allows the most detailed assessment of the joint and can help to determine what surgical treatment is appropriate or might be of benefit. Unfortunately, this will not provide a cure and cannot guarantee any lasting benefit although many patients benefit for a period of up to six months and some for much longer. This operation is for patients who have developed an increasing deformity as their arthritis develops. The aim of the operation is to realign the leg so that the weight-bearing forces are directed away from the most damaged area. Either a “wedge” of bone is removed or the bone is streched apart at one side close to the joint and the bone is then held until it heals with a staple or plate. This is only useful in patients whose arthritis is limited to either the medial or lateral compartments of the knee and is often a good solution for patients who are young and hope to get back to a high level of activity. This is the treatment for severe arthritis that has not responded to alternative appropriate treatments and continues to cause pain the significantly interferes with a patients function. This is an operation to resurface the worn out joint surfaces of the knee with an artificial knee made of metal and high density polyethylene. The operation can take the form of a partial or uni-compartmental knee replacement when only part of the joint is severely arthritic or a total knee replacement when the entire knee is affected by arthritis. It is extremely successful in relieving the pain from severe arthritis but involves a significant recovery period and has more significant associated risks and long-term implications.